[New for 2018] I find it amusing that we have a secondary trend going on this year... ok, trend might be a stretch, but is it not amusing that Haagen-Dazs Trio is being joined by Edy's Triple Cores and Turkey Hill Trio'politan. 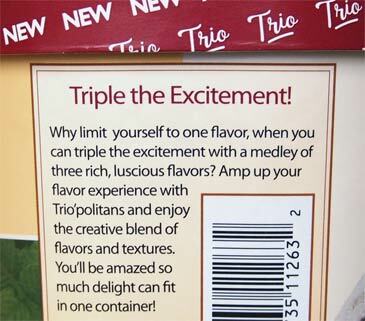 The lid even says "Trio" all over it. 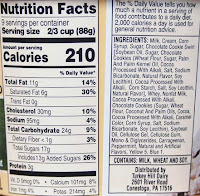 Now while Breyer's is busy swirling two frozen dairy desserts in to one container, Turkey Hill is taking things up a notch by shoving three ice creams in to one container side by side by side. 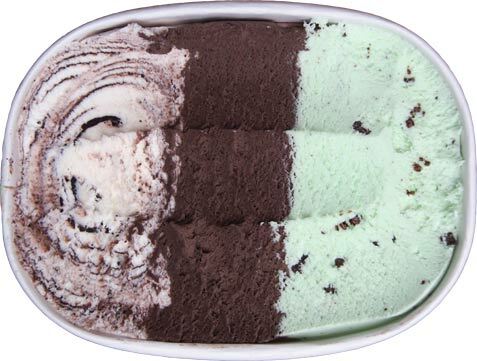 and mint ice cream with chocolate cookie pieces. Ha! The swirl in the vanilla side amuses me. I steal a few little bites and the mint is pretty strong. The dark chocolate is fun. The vanilla brings in that familiar turkey hill cookie swirl. Now more mint bites. Fun. 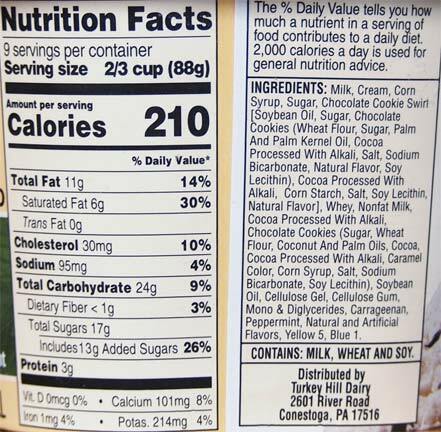 The cookie bits are crunchy instead of a softer cookies & cream style cookie bit. And back to dark chocolate. Oh, that's a really nice dark chocolate flavor. It's fun bouncing back and forth here. And I made short work of that bowl. The dark chocolate is definitely my favorite. It's got a chocolate cream pie filling vibe to it (if that cream pie was leaning a little darker / richer ofcourse). The ice cream itself is a bit fluffly / airy, but I still had a fun time and what more can you ask for? Wait, I know what I can ask for, another scoop because I'm still hungry! On Second Scoop: Sorry, forgot to throw in the second scoop thoughts and now we've already gone through two containers of this one. Ok, my daughter has gone through two containers of this one. She obviously likes it though she hasn't been in much of a chocolate mood so the second container still had about a 1/3 of the chocolate section left when she was done with it. I bought this as soon as I saw it. Overall I liked it, but for me the dark chocolate was a bit chalky. I only noticed it if a spoonful was more chocolate than the other two flavors. I will recommend this to others though! I'm currently trying this combination and think it's my favorite of the four (still need to hunt down the "All Natural" flavor). First, it's a great concept - sometimes you want more than one flavor, but REAL ice cream can be pricey, and the traditional Neapolitan of vanilla, chocolate, and strawberry just won't do. And YES - the crunchy cookie bits are yummy! I tried this is an it was excellent. I will definitely be purchasing it again when it goes on sale! 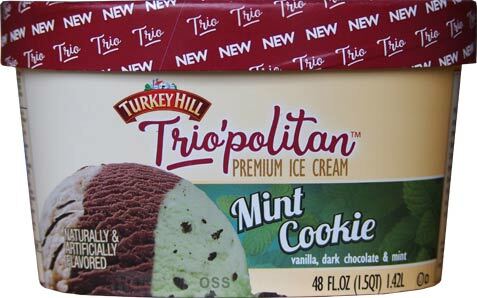 Why not Turkey Hill done a all three mint flavor Neapolitan. Starting with mint patty flavor, thin mint flavor, and "breath mint" flavor which could had andes mints mixed in. I tried the Coco Loco flavor and loved it! The mint side is crunchy, tasty, minty, and stunning. 10/10. 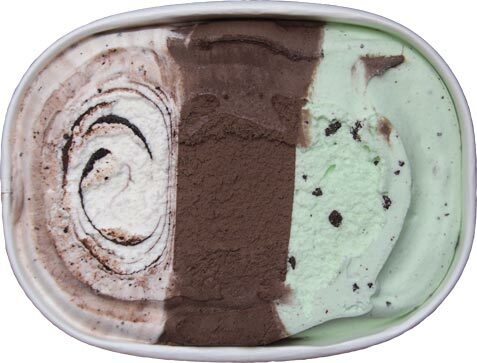 The cookie swirl delivers and oreo and vanilla flavor that is spot on. 10/10. The real verdict? (Or the third scoop?) Is this flavor nails two out of the three. It seems as if the chocolate flavor as an after thought, like, hey, we need three, throw in chocolate... and call it "DARK". They'll buy it. That was true, I bought it. But it's far from Dark Chocolate (other than the color). But the mint and vanilla sides? Perfection. They should have just made it VANILLA, COOKIES AND CREAM, and MINT. So there's your real, honest review (as usual) mr/ms ON SECOND SCOOP. I've wrote these before for you and you've responded with anger, which is confusing, because we both agree on one thing: WE ARE PASSIONATE ABOUT OUR ICE CREAM. Now don't get mad or respond with a hissy fit. Enjoy this review, use it, publish it, and hey, maybe you need a "THIRD SCOOP" reviewer like me to keep things REAL. BAHAHAHAAHAHAHA if you think this comment earns you a spot at the OSS table. You call me a liar and think I want your help? Yeah, that'll happen. Go back to your magic 0 to 10 rating scale because it needs some work. Have you tried the triple chocolate one yet? Just tried for the 1st time tonight Freakin Amazing! It just goes to show that everyone has a different taste experience - I was raving with my husband tonight about how the dark chocolate is so outstanding, the finest chocolatiers would be jealous! It is AMAZING. This is the ultimate ice cream experience, and we can't keep it in our freezer. SO GOOD! Glad you enjoyed it, don't think they would be jealous though. This has become mine and my husband's favorite ice cream. All 3 flavors are outstanding on their own, and are wonderful blended as well, although I think we may both be partial to the dark chocolate, it has a consistency like frozen pudding, so creamy! Tasty! Just bought this ice cream at Kroger's, and had to try when I got home. I love mint and I love dark chocolate. I love this ice cream. We usually buy Kroger's brands Deluxe and Private Selection. This was at the top of my ice cream list.